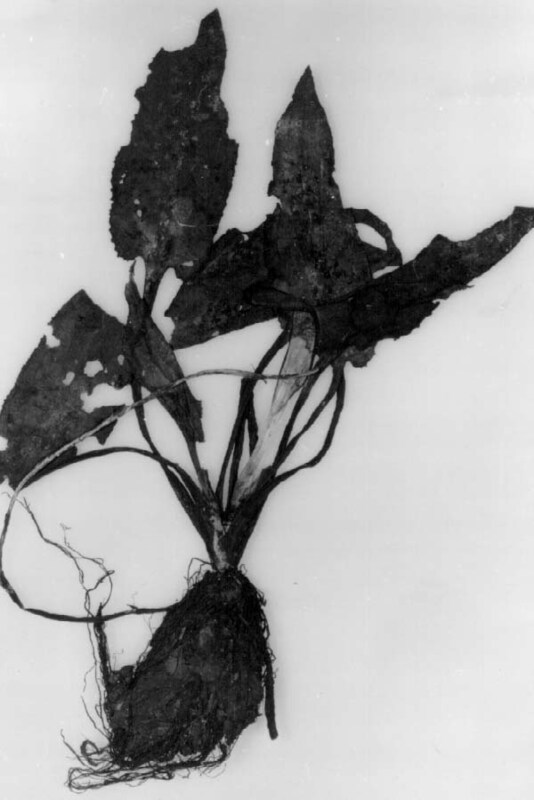 Almost 40 years after its discovery in 1971 in Papua New Guinea by Mr Katik, the plant is found back by Takashige Idei. 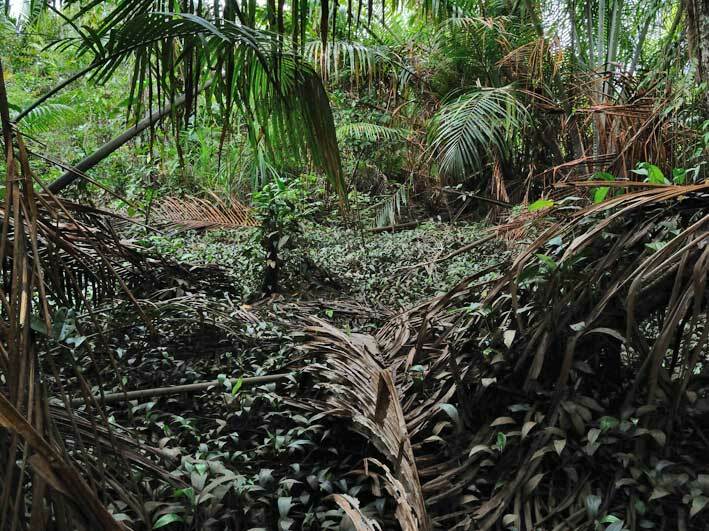 In the last decades attempts have been made to find the spot near the Kiunga airstrip but they were unsuccessful, and we did not have any pictures at all of a live plant. New Guinea is very poorly known in respect of Cryptocoryne. 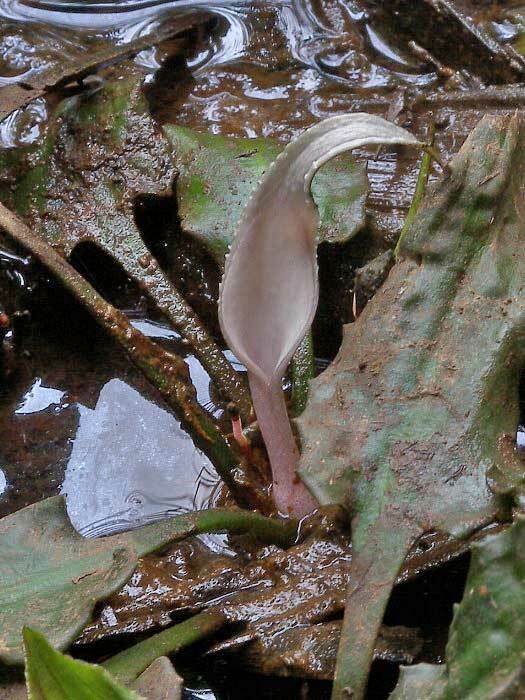 The other known species from New Guinea are C. versteegii and the well known C. ciliata growing in both the Indonesian Papua province and Papua New Guinea. 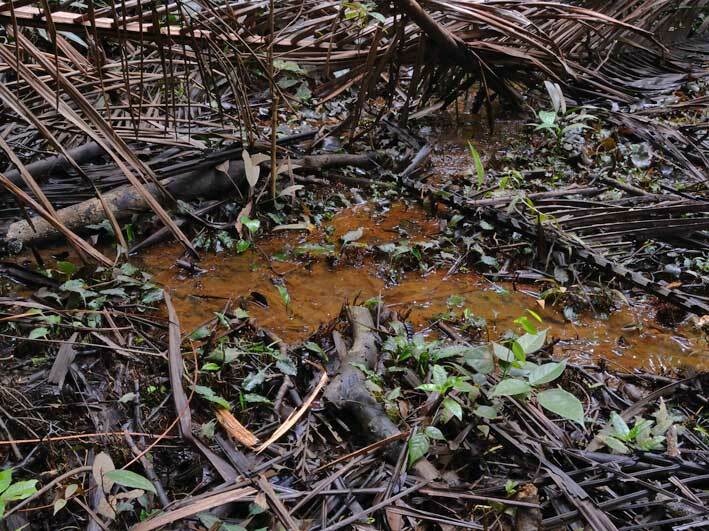 Cryptocoryne dewitii grows in a marsh area near the peat swamps under a Sago palm canopy. photo Idei Detail of of the habitat. A layer of fallen leaves covering a thick layer of peat. photo Idei Green, bullate leave blades with an eared (auriculate) base up to 9 x 5 cm size. The margin is finely undulated. 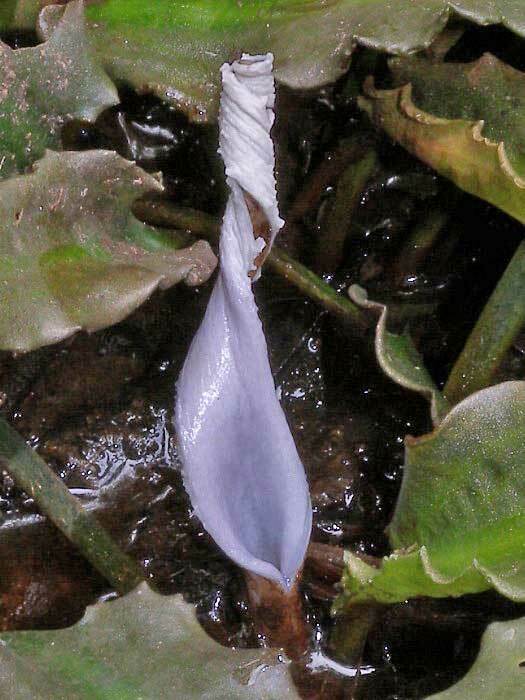 photo Idei The limb of the spathe may be twisted and folds back. There is a slight variation in colour of the limb. There is a more or less clear visible collar zone. photo Idei The limb of this spathe is strongly twisted at the top. photo Idei Often the limb has rough protuberances on both sides of the limb. photo Idei Apparently the limb did not open (yet?) at full length, giving this abnormal look of this spathe. photo Jacobsen C. dewitii from the Nationaal Herbarium in the Netherlands (L). 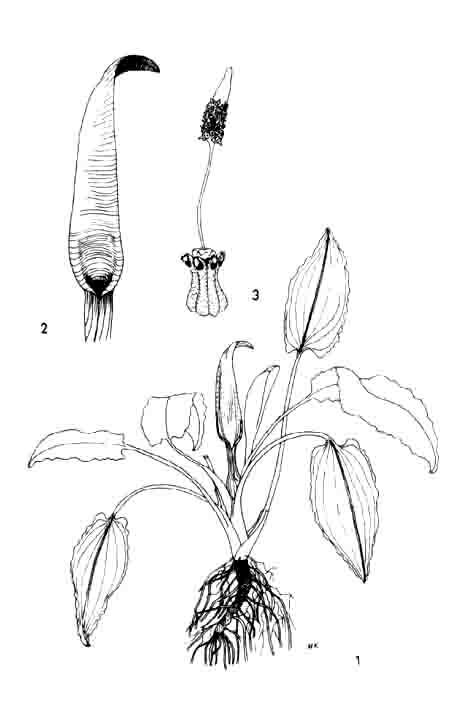 Nationaal Herbarium, the Netherlands Drawing of Cryptocoryne dewitii in Jacobsen (1977) based on the herbarium sheets. drawing Marianne Krøjgaard Distribution of C. dewitii. 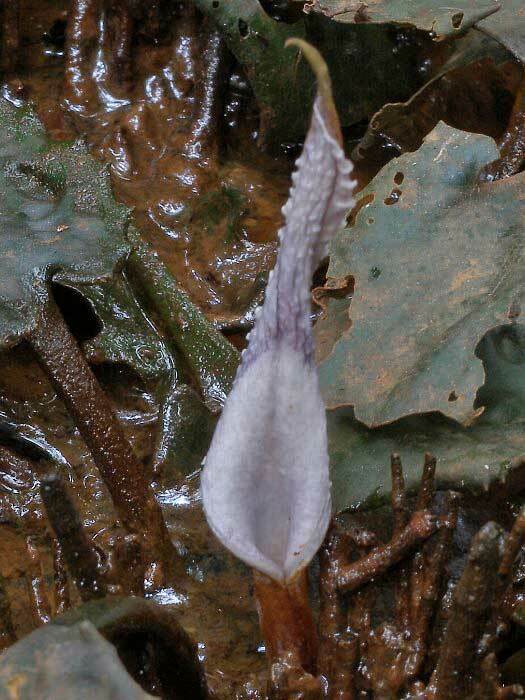 It is only known from one spot near Kiunga in Papua New Guinea. Plants from the collection, made in 1971 by Katik, were distributed over the Smithsonian (US), Leiden (L) and the Lae (LAE) herbaria. 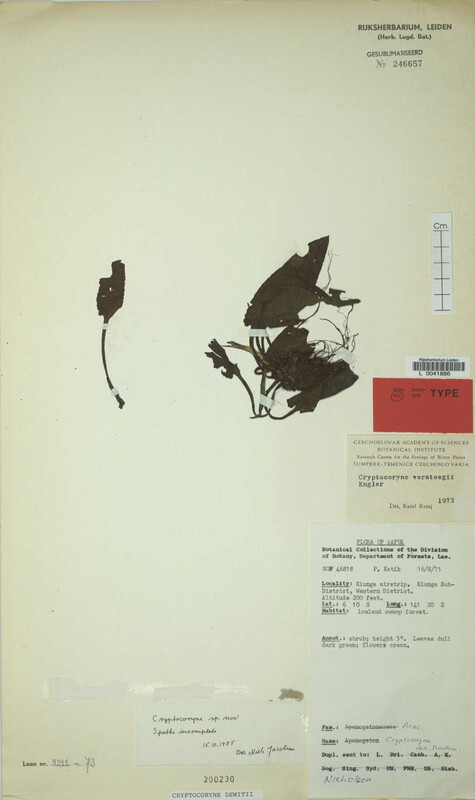 The description of C. dewitii is based on these three herbarium sheets. 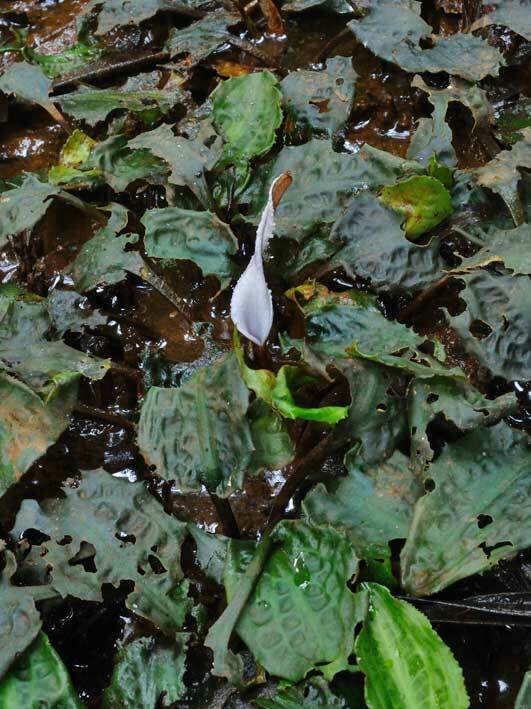 Cryptocoryne dewitii is named in honour to professor H.C.D. de Wit, who was the leader of the Cryptocoryne studies from the fifties to the eighties in the 20th century. This rediscovery is just 10 years after his death. Hay, Alistair, 1990. 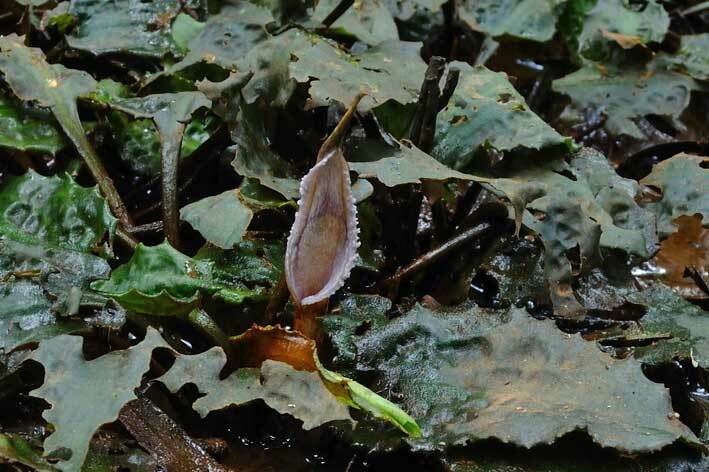 Cryptocoryne in: Aroids of Papua New Guinea: 49 - 52, Christensen Research Institute, Madang, Papua New Guinea. Jacobsen, N., 1977. Cryptocoryne dewitii N. Jacobsen sp.nov. (Araceae). Bot.Not. 130 : 381-382. Jacobsen, N., 1982. Cryptocorynen, Alfred Kernen Verlag, Stuttgart. Leach, J & P.L.Osborne, 1985. 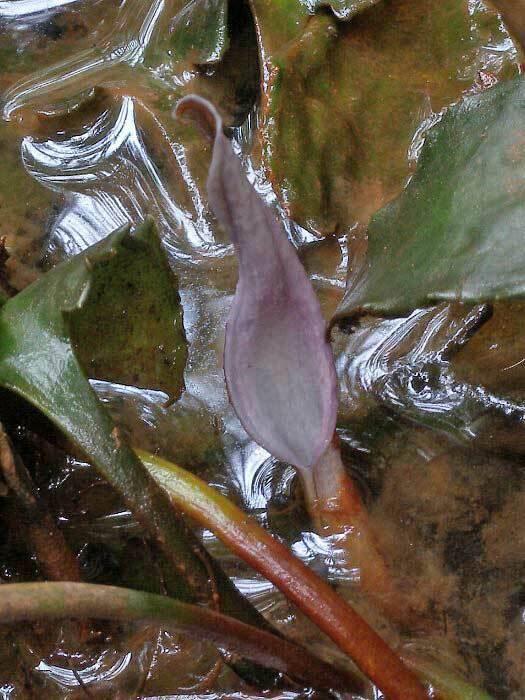 Freshwater plants of Papua New Guinea. 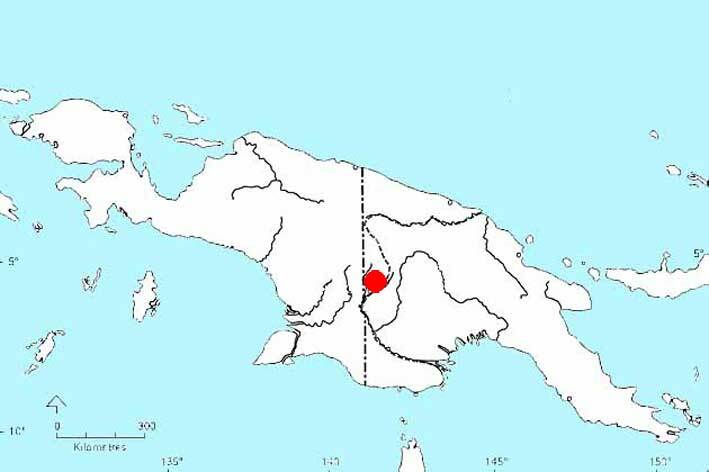 The Universtity of Papua New Guinea Press. Wit, H.C.D.de, 1990. Aquarienpflanzen, 2. Auflage, Ulmer, Stuttgart. ISBN 3-8001-7185-6.